Super Mario 64 was originally released for the Nintendo 64 on September 29, 1996; 15 years ago today! Super Mario 64 saw an updated release of sorts, with the release of Super Mario 64 DS in 2004. The original Nintendo 64 version was re-released through the Wii's Virtual Console service on November 19, 2006 at a price point of 1,000 Wii Points, which is $10. The Virtual Console version received an updated ESRB rating of "Everyone" with no content listed for parents/gamers to be aware of. 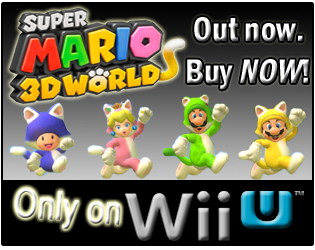 How many hours have Wii owners reported running around Mario's first 3D world with almost 5 years of data reported? Well, with Super Mario 64 having its 15th birthday today, let's take a look! you can find the details by clicking HERE! 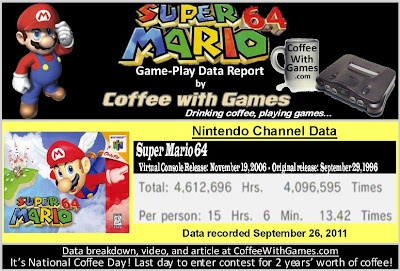 Super Mario 64 has about 305,260 Wii owners that have reported game-play data through the Wii's Nintendo Channel, with 1,772 days possibly reported since it was released. 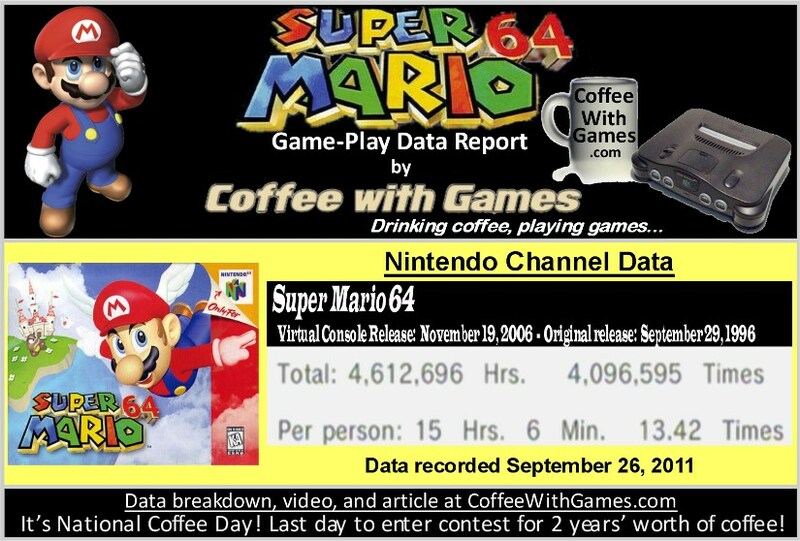 Super Mario 64 has 4,612,696 Total Hours of game-play reported, with an average play-time of 15 Hours 6 Minutes "Per person" that has reported data. The game's average play-time per day/session reported is 1 Hour 7 Minutes. Super Mario 64's Amazon.com sale rank is #640, and ranges from $13.00 for a used copy, all the way up to $335.00 for a new copy. Super Mario 64 is currently listed in the #7 spot in the Virtual Console's "Popular Titles" section, as of checking around 1:00Am on September 29, 2011. The "Popular Titles" section lists the current top 20 most popular Virtual Console games. While Super Mario 64 is at the #7 spot, many other games in the "Popular Titles" section have the name "Mario" in their titles. 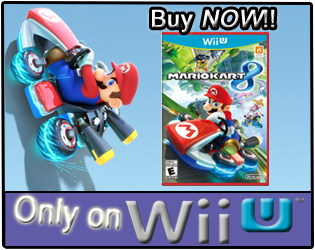 As a matter of fact, nine out of the 20 games have "Mario" in their titles. According to its Wikipedia page, Super Mario 64 was the best-selling game for the Nintendo 64, selling more than 11 million copies world-wide. Super Mario 64's United States Virtual Console re-release has made Nintendo about $3,052,600 before taxes, based on the approximate number of players that have reported data and the games $10 price point. Super Mario 64's "professional" review score average is 95.95%, based on 19 reviews on GameRankings.com. The game has a 4.5 out of 5 Stars rating on Amazon.com, based on 307 customer reviews (I took one review away from the average, because it was a complaint against a seller, and not the actual game). Super Mario 64's customer review score average is 93.61%, when the reviews are converted to a 100% review scale. I can remember going to one of my best friend's house for his birthday in the 90s, and his parents had rented the Nintendo 64 console and Super Mario 64 for us to play (yes, this was when you could rent consoles as well as games). It was a sleepover party, so we were up late into the night, but I can remember waking up the next morning and my other best friend was asleep on the floor, in front of the tv with the Nintendo 64 controller still in his hands! He had stayed up late through the night playing Super Mario 64, and evidently didn't want to put the controller down, for fear of not getting to play the game again I guess...you know who you are if you're reading this! While I did not own Super Mario 64 on the Nintendo 64 console, I do now own it on the Virtual Console. I still have not completely beat the game, though I have played and seen much of it from when it was originally released on the N64, and watching/playing the game with friends. As for the reported game-play hours, I think the average hours "Per person" are really good for the game, and I think the asking price of $10 for the game is very reasonable, and I would recommend it to any of you haven't played it. Perhaps I'll start up my file on Super Mario 64 here again soon, and finish the game once and for all; I mean it's not like I have had the last 15 years to do it or anything! So in short, today is Super Mario 64's 15th birthday of sorts. It was a release title for the Nintendo 64 console 15 years ago, and it is the second highest rated game on GameRankings.com for the Nintendo 64. Did any of you play Super Mario 64 on the Nintendo 64 console? If so, what are you memories of playing the game? Did you beat it, or like me, did you just explore and play many levels, but never see the ending credits? If you did not play Super Mario 64 originally on the N64, have you played either the Nintendo DS or Virtual Console version of the game? If so, what did you think of the game-play, and would you recommend it to other gamers now? Oooooh yeah. One of my best friends and I both had this game, and it was a lot of fun. He beat it before I did. At the time, the entire 3D world thing was pretty novel - and very cool. It's interesting to note though - that once I beat it, I hardly ever picked it up again. Over the years, and I think I've mentioned my feelings on this board before on this topic, but the 2D Mario titles have generally held my interest better than the 3D ones. I own the N64 original, the VC version, and the DS remake. Great game. Don't have any copies of the game, but I do wish I have. Maybe next Wii VC purchase? Never played any of the 3D mario titles in any form, but maybe one day with M64 or if SMG/SMG2 get cheap enough. "...the 2D Mario titles have generally held my interest better than the 3D ones." I think the game-play data for the Wii Mario titles definitely confirms your opinion, for other people as well. New Super Mario Bros. Wii has a pretty high average "Per person", but the game itself doesn't take that long to finish, so I think it suggest people are playing it many times. Is there one version of the three you would recommend more than the others, and for any particular reason? I would go with the Virtual Console version just because of price, but it should be noted, the VC version does require a Classic Controller to play. SMG is now only $20 as a Nintendo Selects title, which isn't bad. I own the game(though it's out on trade/loan right now), and like Chalgyr with SM64, once I finished SMG, I never played through it again. Thank you all for the comments/feedback! Feel free to join the conversation at any time...as feedback is always welcome! I'd agree with Chalgyr, have always been more into the 2D verions. As for the selects I have been eyeing a few of them, but will hold off.